I am in Malaysia now. In Sabah, at a resort. I am currently in the middle of three solid weeks of buffet breakfasts and dinners and am therefore very full and bursting at the seams (or at least my poor jeans are haha). But not to worry, I can start exercising again and eating less in the new year. Last night we had a full Christmas dinner - turkey, sides, pudding etc. YUM. I have been eating an insane amount in Malaysia... and yes I've been taking lots of photos of everything I eat so prepare for some massive food blogs after I get back. I just saw this recipe (though it's scarcely a recipe, merely a guide) for Vodka Sangria on New York Nick, on the Lifestyle channel, and thought I'd better write it down before I forget. But why simply write it, when I can post it here for all the alcoholics I know? Mix together, preferably in industrial quantities, in a huge bucket, and drink! Whenever I would see a fat chef on TV, or in a book, I would usually comment to my dad or brother "Wow. He/she must be a great chef, he/she's so fat!" Then I would usually say "Well, if I could cook like he can, I would also be fat". I think ages ago Adri might have said to me "Nigella's larger than she looks on the TV, apparently" to which I probably replied "Well, if I could cook like that I would also be fat". Not that I think Nigella's fat, but she certainly is generously proportioned (and completely lovely too!). Anyway, recently (as you will have noticed) I have been cooking a lot, mainly Nigella's recipes, and consequently eating a lot. And I have gained weight. (Not loads, but I've noticed it). Oh well. I suppose it is a result of becoming better at cooking. And the party season. And we're going to Malaysia this week! I'll have to make an effort to eat healthier once we come home. Last week I went down to Main Ridge for two nights to help out with my friends' film shoot. They were shooting a pilot for a sketch comedy program, and they required a caterer (me). I had a budget of $350 (we only spent $300 though, YAY). It was more difficult than expected, because I had to cook for 16 people, stay within budget, and attempt to make stuff that most people would find edible. And lots of the people up there weren't very adventurous. (There were people who didn't eat mushrooms, seafood, rice, pork, meat etc). Here's what I made (mainly made at home, in advance and reheated up there). Breakfasts were just cereal, toast, milk, fruit and juice. And tea and coffee, of course. I also bought a couple of packets of Assorted Creams. With the leftover money, Lexi (director's girlfriend) went down to the supermarket and picked up loads of snack foods (Timtams, mint slices, chips, snakes, etc). Oh my god I ate so so much crap. The food I made was high fat and carby enough as is, but combined with the snack food! Jaffe also brought up homemade brownies, with insanely huge choc chips (white, milk, dark). Mmmmmmm. Beautiful and addictive. (Did you know that you can make new brownies by smooshing together leftover brownie crumbs?!) Also I think I ate more than I usually do when I go up there because there just wasn't much to do! Usually when we go to Al's holiday house, we watch DVDs, eat drink talk and smoke all day (well, Al did still smoke a lot - he was very very stressed and was constantly smoking cigarettes and drinking coffee/energy drinks!) But, as most people were working on the filming, I had a lot of spare time in between cooking and cleaning. I watched DVDs with Lexi, read Past Mortem (all of it in 1.5 days!) slept, watched the filming and ate crap! It was a really good experience overall though. I don't know if I'll ever do anything food-related that's professional, but you never know. On Saturday last week, I made my first proper feast from Feast. 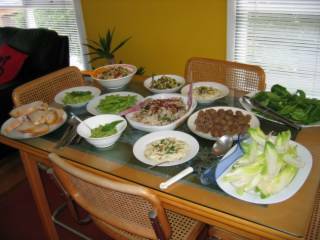 Even though I've made recipes from the book since I got it (Penne alla Vodka, Ricotta and Pine Nut Salad etc), this was the first time that I had people over for a big feast and made a big selection of dishes. Most of the recipes are from "A Mezze Feast for ten to twenty", in the Wedding Feast (hah) chapter, but I got a couple from other sections / Nigella books. served with sugar snap peas, witlof (aka chicory) and toasted sourdough bread. 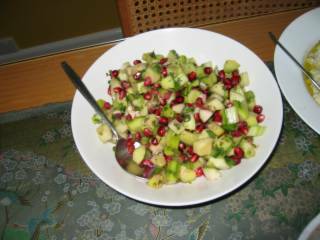 Pomegranate and Cucumber Salad - how pretty is it? I can't believe I made so much! I was so paranoid there wouldn't be enough food (for 6 of us), but believe me, there was PLENTY. (In fact there are still leftovers now, almost a week later!) And the table was groaning with the amount of food - no room for plates at all, so we ate on our laps around the kitchen, haha. It was all a pretty relaxed process, I didn't stress like usual. I had been out the night before, slept over at a friend's house (Hi Georgina!) and got home at about 8am, had breakfast and then started cooking. Cooking was a good hangover cure! It was pretty hot that day (30 degrees?) so I just took it easy in the kitchen. Jess T & Eliza (the guests) helped to make the guacamole. It was a really rewarding experience in total. Just a fun day, and it was so so so great to catch up with Jess & Eliza - both a social and a culinary experience, with neither overshadowing the other! (Which, I think, fits in with Nigella's philosophy of food).